Fall means changing leaves, Halloween costumes and the chance to pick your own pumpkins. Here are some of the most popular pumpkin patches in the St. Louis area. Going to Stuckmeyer’s for pumpkins is an annual event for many area families. Stuckmeyer’s is a family owned vegetable farm that’s been around for decades. The pumpkin patch is open every day in October, but if you go on a weekend in October you can also enjoy Farm Fun Days. This event features hayrides, farm animals, pony rides, live music and more. Stuckmeyer’s is located at the intersecton of Highways 141 and 21 in Fenton. For more information, call 636-349-1225. Eckert’s Orchards is a year-round destination for St. Louis area families. In October, the pumpkins take center stage. You’ll find any size pumpkin you need at the Eckert’s locations in Belleville, Millstadt and Grafton. Eckert’s also hosts many other fall events including haunted hayrides, bonfires, pumpkin parties and more. The Belleville location is open daily from 8 a.m. to 8 p.m. The Millstadt location is open daily from 9 a.m. to 6:30 p.m. The Grafton location is open daily from 9 a.m. to 5 p.m.
Rombachs Farm is a popular spot for pumpkins in St. Louis County. You’ll also find fall decorations and dried gourds for your home. The Rombachs Farm pumpkin patch is open daily in October from 9 a.m. to 6 p.m. It’s located at 18639 Olive Street Road in Chesterfield, near Spirit of St. Louis Airport. For more information, call 636-532-7265. Relleke Pumpkin Patch is a good place for pumpkins in the Metro East. The pumpkin patch opens at the end of September and is open every day through November 1. Hours are Monday through Friday from 9 a.m. to 6 p.m., and Saturday and Sunday from 10 a.m. to 5 p.m. Relleke Pumpkin Patch is located at 473 Sand Prairie Lane in Granite City. For more information, call 618-797-6858. Thies Farm knows how to celebrate the fall harvest. Not only will you find the perfect pumpkin, but in October, both locations are transformed into a “Pumpkinland” play area for children. Pumpkinland is open Tuesday through Saturday from 9 a.m. to 6 p.m. and Sunday from 10 a.m. to 4 p.m. Theis Farm is located on North Hanley Road and in Maryland Heights. For more information, call 314-428-9878. Golden Valley Pumpkin Patch in Franklin County offers all kinds of fall fun. There are hayrides, a corn maze, farm animals and pony rides. And of course, plenty of pumpkins to take home. The farm is open Saturdays and Sundays starting September 26, from 10 a.m. to 5 p.m. It’s located at 6320 Highway 100 in Washington, MO. For more information, call 636-221-1956. Check out the pumpkin patch and more at Herman’s Farm Orchard in St. Charles. You can pick your own pumpkins, choose from a variety of hearty mums or shop in the market. Herman’s Farm Orchard is open every day from 9 a.m. to 7 p.m. It’s located at 3663 North Highway 94. For more information, call 636-925-9969. There are various plants that fit in with the fall. Some types to choose from include sage, white clover, sedum and verbena. You will need to care for them regularly so they won’t freeze or grow brittle. However, they will otherwise look beautiful and allot a natural ambiance to your front porch. If your benches, couches, dining porch furniture or swings need a touch of fall, you could buy or sew together some pillow cases for the season. You can sew Halloween designs like ghosts, bats, witches or cats. If you want a fall aesthetic, design pillow cases with leaves, tree branches or perhaps pumpkins. Other accents to add to your furniture include blankets for curling up at night, candles on the table or a centerpiece. 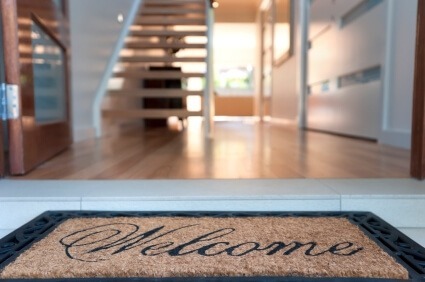 Welcome mats are important, and you can always change them out to match the season. Why not invest in a new one specifically for fall or Halloween? You can have one with leaves, trees or other designs that match your porch. If you want one that’s spooky, get a Halloween-themed mat. Then you can switch it out when winter comes. Some extra fall decor to add includes bales of hay, straw, scarecrows, a welcome sign or post, pumpkins, jack-o-lanterns, gourds, ravens, crows or maybe a fall-themed wreath. You should include what you feel best suits your budget and the landscape of your porch and yard. Be sure not to add too much to prevent cluttering. Everything you add should be accented with the right lighting. Buy rope lights and install them around your railings, door frames or supports. Maybe enlist the help of an electrician to install spotlights, hanging or standing lamps to accent the decor as well. You should always lean towards LED lighting to save money while still allowing for a bright glow to envelop your porch. 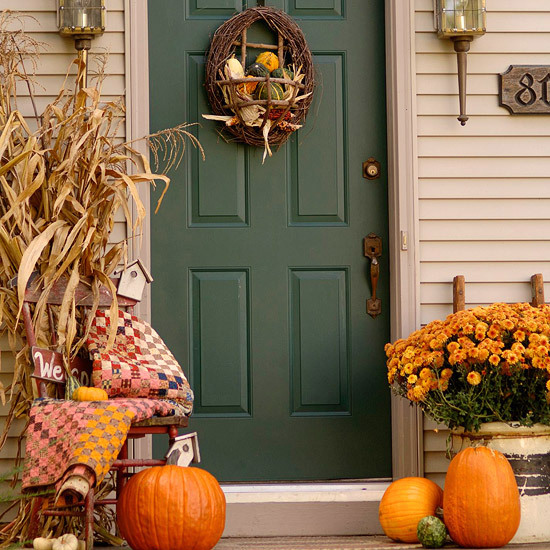 These are a few recommendations for your fall front porch decorations. There are many options available depending on your budget, and what you feel blends into the landscape. 1. Attend a Barn Dance. Whether it’s contra dancing or square dancing, hoedowns are a great way to spend fall evenings and nights. Have a blast and work up a sweat in the cold, autumn night air while you dance along to foot-tapping bluegrass and fiddle music! 2. Go Mountain Biking. Okay, so you can mountain bike at any time of the year (except maybe the dead of winter…ice and snow are no bueno for your tires). But there’s something about the chilly air and bright orange, red, and yellow leaves all around you that makes biking during the fall so amazing. 3. Take a Scenic Drive. Early to mid-fall is one of the prettiest times of the year, as the trees still have most of their leaves which have turned vibrant with the coming cold. This is the one of the best times to take a drive through the woods, around town, or through the mountains. 4. Go Pumpkin Picking. Fall season means one thing – pumpkin season! Restaurants, coffee shops, grocery stores, and many other places around town start selling pumpkin foods, drinks, and products to welcome in the season. You will also be able to find whole pumpkins all over town, whether you want to go pick your own at a patch or get one from the store. If you do take a trip to your local pumpkin patch, you can do many fun, free activities that they offer, like hay rides, corn mazes, and petting zoos. Make a jack-o-lantern with your new prized pumpkin and be sure to keep the seeds so you can roast them! Yumm. 5. Host a Bonfire. Shorter days and cooler weather make perfect ingredients for a bonfire. Grill out, have a tub of hot apple cider, and don’t forget s’more fixings! 6. Go Climbing. One of the best times of the year to rock climb is during the fall. As leaves begin to drop and greenery wanes in anticipation for winter, rock faces become more exposed. Cooler weather also means fewer bugs zipping around your face as you make your way up the cliff! 7. Do Some Photography. Bright multi-colored leaves, teaming autumn wildlife, colorful pumpkins and gourds, and clear, sunny days make for great photo ops. See what amazing autumn things you can capture on your camera! 8. Go Camping. Cooler, dryer weather means fewer bugs and fewer people, so fall is one of the best times to go camping. Just remember your cold weather hammocking gear, and you’ll be toasty and comfy in the chilly autumn air! 9. Visit an Orchard. ‘Tis the season for apple picking! The prime months for ripe apples is September and October, and most local orchards open their doors to the public during this time to do some picking. Just think of all the pies, apple butter, cider, and applesauce you can make! And even if you’re not a big apple-eater, just strolling through the trees in the cool fall weather is a great way to spend the day! 10. Play Some Pick-Up Football. Labor Day weekend officially kicked off football season, so what better way to celebrate that than to play some football yourself? Grab family and friends and head out to the park or backyard for some down-set-hike! Fall is the best time to prepare your lawn for next spring because you can do more now to impact how your lawn will look next year than at any other time of the year. Unfortunately, many of us have lost our enthusiasm for yard work at this time of year, because we’ve been hard at it all summer, and because many of us think about lawn care only during the fresh exciting months of spring when everything is growing. If however, you can get out there and do a few last easy tasks this month, it’s a guarantee that you’ll be way ahead for next year. That’s because with cooler temperatures, the grass is going to be focusing on root growth. Therefore, we want to build up the density of the grass and encourage the most vigorous, healthy turf we can now to enjoy later. Another good thing about giving your lawn a little care in the fall, is that you can do more for weed control by attacking them right now than can be done with two or three weed killing applications in the spring or summer. Lastly, none of the following items take long to do, but the results will look like you spent hours because your lawn will come blazing into spring with immense growth and color. A winterizer fertilizer is like a 7-3-2. They are usually clearly labeled. Other common winterizing fertilizer formulas are 18-6-12 or 15-5-10 which come in organic and non-organic products. The winter weeds are germinating like crazy in the fall, and getting ready for next year, so make sure you apply a pre-emergent as soon as possible. The best time to apply a pre-emergent to combat winter weeds is in August or September, but if you haven’t done so yet, do it now! A good organic pre-emergent is corn gluten meal. Corn gluten can be found at most garden centers. By attacking the weeds now, you can do more about weed control than you can in the spring or summer. If you have a lot of leaves, mulch them up and apply them to your lawn. They won’t contribute to thatch and they act almost as another fertilizer application for the turf. Lastly, mowing is the single most important thing you can do to manage the vigor of your grass and its ability to compete against weeds. In the fall, the best results are obtained by mowing at the highest setting on your mower. In no case should the mowing leave the grass less than 1.5 inches (3.75 cm) tall. This will help insulate the grass during the winter. The trick to designing your garden with perennial flowers is making sure you have something wonderful in bloom all the time. Each season has its stars and fall flowering perennials have some of the best. Fall flowers have all season to grow, so many of them are tall and stately. Fall bloomers also tend to blossom in the jewel tones of the season, deep purples, rusts, scarlet and gold. For fall bloomers to be hardy in your garden, you need to plant and establish them earlier in the season. Here are some top picks for fall blooming perennial stars. In shades of pink, purple, blue and white, these delicate daisy-like blossoms start popping open in late August and continue on until frost. Pinching in the early summer turns these Asters into mounds with dozens of flower buds. Asters will tend to creep throughout your garden, but their airiness allows them to blend particularly well with other flowers. Caryopteris is a sub-shrub that is often grown in the perennial garden. Caryopteris slowly blossoms in August with dazzling blue flower clusters. Just try and keep the butterflies and bees away. Caryopteris is cut back in early spring, like a Buddleia, and the gray-green foliage is attractive all season. Nick-named for their blossoms shaped like turtles heads, Chelone is a carefree fall blooming perennial whose only real dislike is excessive dry heat. Chelone behaves itself, growing in a dense clump with attractive foliage and red, pink or white blooms. There are many varieties of mums, not all particularly hardy. The plants sold in the fall as ‘Hardy Mums’ should have been sold to us in the spring, to be reliably hardy in the north. However we wouldn’t have had the patience to plant them and wait. Mums and pumpkins are the flag bearers of fall. Try and get your potted mums in the ground ASAP. Keep them well watered and mulch once the ground freezes and you’ll stand your best chance of having truly hardy mums. Joe Pye is one of those native plants we take for granted because we see it by the side of the road, but it makes a wonderful backdrop to a garden border. The newer Eupatoriums have been bred shorter and less weedy but the dense mop heads of mauve flowers still blend in beautifully in the fall garden. Helenium is making a resurgence in gardens. They look like small russet-toned coneflowers, in reds, yellows and oranges. Many helenium can grow quite tall and will need to be staked or pinched. Like clematis, they like cool feet and hot heads. Helenium is also a good choice for poorly drained areas. Helianthus is a good natured, jolly plant, branching and flopping on its neighbors. The brilliant gold fluffy daisy-like flowers make an instant focal point and attract butterflies and birds. Helianthus tend to be sterile and can be reproduced by division. Heliopsis is very similar to Helianthus. Heliopsis tends to begin blooming earlier in the season and stays on for 8 or more weeks. Newer varieties have been bred smaller and sturdier, for less flopping. Sedum ‘Autumn Joy’ comes as close to perfection as any plant can. It looks good all year, requires minimal attention and attracts few problems. It’s only drawback is that it is not deer resistant. ‘Autumn Joy’ has been joined in the garden by a growing number of fall wonders like: ‘Bertram Anderson, ‘Brilliant’ and ‘Matrona’. No fall garden is complete without sedum. Goldenrod is finally getting the respect it deserves, especially with introductions like ‘Fireworks’ and ‘Golden Fleece’. Unlike the native solidagos that spread everywhere and never stood up on their own, these newer varieties are sturdy and chock full of fall blooms. As a parent, there are many things you can do at home to help your child have a good school year. These include making sure your child gets enough sleep, getting him to school on time, and reading at home every day. Here are ten important ways to get started! Children need regular medical checkups, immunizations, and dental care. Check with your school to see if a physical and immunizations are required before the new school year. Some medical and dental services may be available at the local clinic or your child’s school. 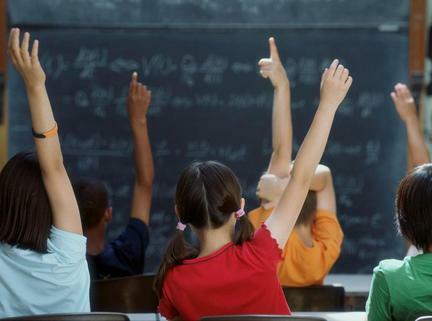 Children who eat a healthy diet and get regular exercise can concentrate better during the school day. It is important that your child eats a balanced diet with plenty of fruits and vegetables, and has opportunities to exercise every day through a sports team, fun activity, or playtime outside. Getting enough sleep will help your child get up on time, feel good, and be ready for a full day of learning. Children need different amounts of sleep at different ages. Ask your doctor how many hours of sleep your child needs each night. It will be easier for your child to complete daily lessons, homework, and tests if he gets to school on time every day. Limit the time your child misses for family trips and activities. Contact the school immediately if your child will be absent. Help your child set a regular time and place for homework. Choose a time that works well for your family’s schedule. Find a place that is quiet and has good lighting. Make sure your child has supplies such as pens, pencils, paper, and a dictionary. Ask your child to show you her finished homework each night so that you can see what she is learning and confirm that she is doing all of her assignments. Limit the time your child spends watching TV, playing video games, and using the computer. When possible, do these activities together, and look for educational programs and games. Help your child understand that he should never give out personal information on the computer or talks to strangers online. Ask your child to tell you about the school day. Ask her what she learned, and how she felt during the day. Listen carefully to her answers, and help her think of ways to solve any problems she might be having in her schoolwork or in the classroom. Set aside time to read with your child each day. You can make reading a part of daily routines by reading stories at bedtime and keeping lots of books and magazines in the house. Help your child get to know the library and what you can find there, including books, audio books, magazines, CDs, and DVDs. Libraries also offer homework resources and a quiet place for students to work. Help your child learn at home by sharing activities together, singing, talking, and telling stories. Visit educational places such as museums, the zoo, the park, or a historical monument. Find out what your child’s interests are, and look for activities and books that are connected to that interest. Date-night doldrums got you down? Stuck in a romance rut? No worries; we’ve got you covered. Here are some of our picks for a romantic date with the one that you love. Looking to add a touch of class to your romantic evening? The St. Louis Symphony at Powell Hall may be just the ticket. The theater’s dazzling architecture oozes European elegance, promising to elevate your night from ordinary to extraordinary. And then there’s the symphony itself, one of the most celebrated in the Midwest. Sometimes balancing a career, parenthood and marriage can seem like a high-wire act. Why not try the real thing? Grafton Zipline Adventures in nearby Grafton, IL, is a great choice for couples looking to add a little adventure to their relationship. The venue’s nine zip lines cover nearly two miles, and set participants soaring from treetop to treetop at heart-pounding speeds while safely secured to a harness. The entire loop takes about two hours and can be worked into a daytrip to Grafton. Those with serious height phobias may want to try one of our other recommendations, but most participants walk away from the experience exhilarated rather than traumatized. Reservations are recommended. The course is currently closed for seasonal maintenance but is scheduled to reopen in spring 2015. Let’s face it: The hardest part about a date night is finding time in our schedules to go out. Sometimes the best solution is to turn “date night” into “date afternoon.” Next time grandma and grandpa offer to watch the kids on a Saturday afternoon, grab your spouse and your bikes and head out for a long, leisurely ride on the Great Rivers Greenway. It’s a great way to spend a little quality time together while improving your health. The greenway currently offers more than 100 miles of trails spread throughout the St. Louis region. Some are tucked away in quiet, wooded environs, while others embrace the hustle and bustle of urban life. Find the one that suits your style, and ride off into the sunset with your mate. Be sure to pack a picnic lunch or choose a trail near a charming cafe. OK, maybe going back to school doesn’t sound particularly romantic, but bear with us for a minute. We all know that the key to any great date is quality one-on-one time, and there’s no denying the sensual aspect of food. Combine the two and you have instant date night success. The Kitchen Conservatory in Clayton offers more than 800 cooking classes each year, and many of them are aimed at couples looking for a special date night. Upcoming date night classes include cooking lessons on cuisines ranging from Chinese to Cajun. A number of Valentine’s Day classes also are offered, but act fast as they book up quickly. Yes, we know. We already sent you back to school for the aforementioned cooking classes, but the same arguments apply here. Plus you get to add alcohol to the mix. The Wine Merchant has been one of the leading – if not the leading – source for wine and fine spirits in St. Louis for more than two decades. Their Clayton store stocks thousands of different wines, from low-cost values to wallet-busting rarities. But “The Merch” (as they like to be called) also hosts dozens of informative and fun classes every year. Whether you’re looking for a basic primer on vino or an in-depth analysis of wines from Bordeaux, Burgundy or Barolo, the Wine Merchant has you covered. They also offer classes on wine and food pairings, and spirits, as well. When the wintertime blues get you down, there’s only one thing to do: Embrace the chill. Grab your partner, head down to Forest Park and lace up your skates for an evening on ice at the Steinberg Skating Rink. The rink is open daily through the end of February, with evening hours until 9 p.m. Sundays through Thursdays and until midnight on Fridays and Saturdays. When your toes get numb, warm up in the Snowflake Cafe with a warm snack or a cup of hot cocoa. Beer and wine are also available. There are plenty of outstanding local restaurants to savor with the one you love, but few can boast the views available at Three Sixty. Located atop the Hilton St. Louis at the Ballpark, Three Sixty offers stunning views in all directions – hence the name. Take in all of the downtown sites while enjoying a glass of wine and a cheese plate. If you’re looking for a more substantial meal, try the rib-eye steak or Maine lobster. Thanks to its proximity to Busch Stadium, Three Sixty tends to get packed when the Cardinals have a home game, so plan your romantic night out accordingly.